whose compounds gave them the blue. was from cobalt not bismuth. the ore always contained arsenic and was useless. 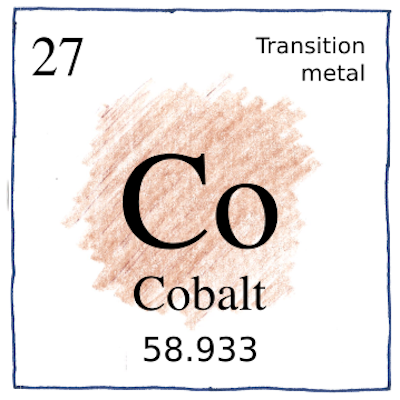 and cobalt oxide, a useless powder instead of metal. make turbine blades and knee replacements. nickel-cadmium, nickel metal hydride batteries also contain cobalt. with tin for cerulean blue, with phosphate for cobalt violet. but that you won’t try. if you think they’re out to get you. won’t come until it’s too late. stirring their pot in the woods? though now it’s been done. Hear him knocking in the dark. Cross your heart and knock on wood. You can’t tell he’s not here. and making things go awry.